Mention the words ‘the Algarve’ and we bet the first thing you think of is beaches. (Golf is probably a close second and you can find our guide to the Algarve’s best golf hotels here) Spectacular sandy beaches, rocky coves and long sandspits characterise this coast and make it Portugal’s most popular holiday region. Whether you're looking for a chic little boutique number or a larger resort style property for all the family, our pick of the best beach hotels in the Algarve has something for everyone. The region has three distinct areas for beaches. The most popular, and the most developed, is the stretch west of Faro which includes Albufeira, Lagos and Armacao de Pera. These are family-friendly resorts with long beaches and all you need for a sea-and-sand holiday. Also in this region are a handful of upmarket resorts - the most well-known being Quinta do Lago and Vilamoura - which offer swanky restaurants, golf courses and sports facilities as well as sandy beaches. To the east of Faro, the landscape is quite different; more low-key, more traditionally Portuguese. Here you’ll find a string of offshore islets - the ilhas - like endless sandspits. The most charming places to stay here are around Tavira and Olhao. And if wilder beaches and surfing are your thing, head to the west, or Atlantic, coast and the villages between Sagres, on the south-western tip, and Odeceixe. With a choice of airlines flying direct to Faro, it’s a very easy region to access. So, decide whether you want to be close to the action or somewhere a little quieter and use our guide to the best beach hotels in the Algarve to plan your stay. Close to the west coast’s surfing beaches, Muxima adds cool and colourful rooms with an exotic theme to the simple, rustic decoration. There’s an eco-pool on site, plus beaches and nature reserve close by. 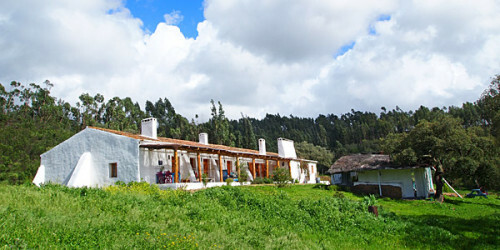 Also close to the west coast beaches, Casa Vicentina offers colourful and contemporary apartments. With a pool and children’s playground, it’s good for families who want flexibility plus there’s a nearby nature reserve which is perfect for bird-watching. 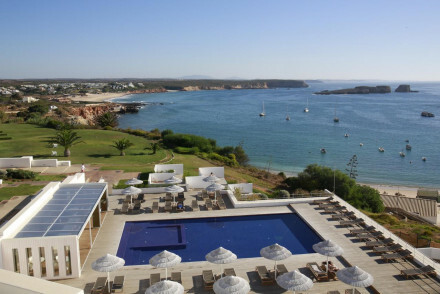 The excellent-value Memmo Baleeira, right on the south-western tip, is a cool, white-on-white design hotel with glorious sea views, spa and lovely outdoor pool. 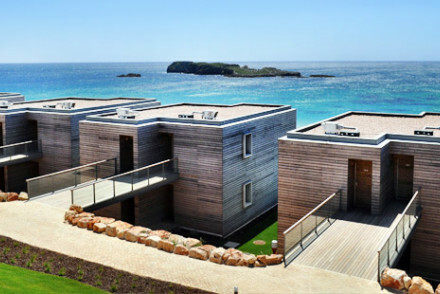 Close to Sagres, in the south-west, Martinhal Beach Resort & Hotel offers a range of options from standard rooms to beachfront villas. Crisp and contemporary in style, with lots of natural materials and glass, it also has a dining terrace. And threre's so much for children on site, they won't ever be bored! 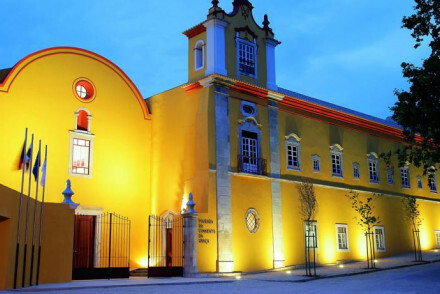 For style and atmosphere, the Pousada Convento de Tavira, a former 16th-century convent in Tavira, will not disappoint. Breakfast in the cloisters then take the simple ferry over to the glorious stretch of beach across the lagoon. 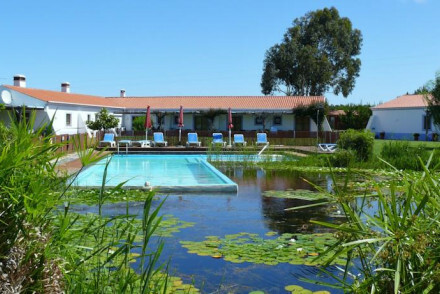 Surrounded by the lagoons and long, long beaches of Ria Formosa Natural Park, Vila Campina is a contemporary-style rural B&B. Rooms are white-on-white chic plus there’s a pool and honesty bar for the days you can’t make the beach. A grown-ups’ retreat. Perched above the beach at Praia da Rocha, Bela Vista Hotel & Spa is well-named; the views from its art deco-styled, blue-and-white rooms are stunning. And if the beach is too much effort, there are chic white cabanas around its pool. Cool and sophisticated. For top-notch everything, Hotel Quinta do Lago is hard to beat. With a private beach, spa, golf courses, pools and tennis courts - plus classically elegant rooms - you will feel truly cossetted. If you want a holiday of guaranteed sunshine and golden beaches, the best beach hotels in the Algarve will certainly deliver! Nothing on our list that ticks all your boxes? Expand your search to include all our Algarve recommendations, or contact a friendly guru for advice. 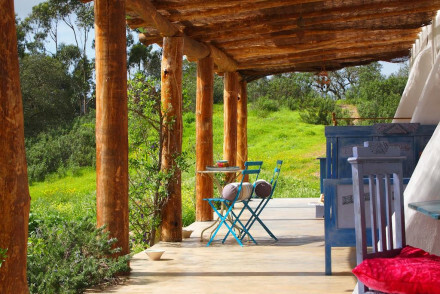 Delightfully rustic eco retreat within striking distance of the best surfing beaches. Large suites with around the world themes, think India to Tunisia. Lovely terraces, eco pool, and nature reserve nearby. Great value for a family holiday and beach life. Families - Family suites and total informality, stimulating books, toys, outdoor games & activities for all. Eco break - Using natural processes and recycled materials. Sights nearby - On the way to the beaches of Carriagem don't forget to visit the Arregata windmill. Surfing - Monte Clerigo Surf & body board lessons are available. A charming collection of suites that sleep up to 4. Stylish, bright interiors, pool, playground for children, and not far from the beach and nature reserve. Be at one with nature in an ideal spot for a family holiday, and great value. Families - Lots of space for children to play, ride or swim and suites that sleep 4, family freedom. Groups - 12 suites, make this a great venue to book up with other families or friends. This chic beachfront hotel overlooks the dramatic Atlantic coast. Bright rooms are dressed in earthy tones with natural accents; the best have a balcony with sea views. The hotel boasts a newly renovated pool, spa and restaurant, plus a fun children's play area. A fresh look for this seaside hotel. Families - This is family holiday heaven- with kids club, kiddie menu, junior dive courses, plenty of beaches and activties. Great walks - Take a picnic and head out along this rugged and stunning coastline and discover some of the least spoilt beaches in Europe. Surfing - Memmo's surf centre offer's lessons, equipment and storage facilities; make the most of some of Portugals best surfing. The varying luxury accommodation at Martinhal, from rooms to beachfront condos to private villas, makes this resort ideal for energetic family holidays. The plethora of water sports and activities available is thrilling. Resort - Your own stylish villa with activites, entertainment and delicious menus. How to make your stay stress free. Private villas - The resort is made up of varying private villas and beachfront condos. A beautifully restored 16th Century convent on Tavira’s castle hill. With Renaissance cloisters, courtyard pool and central garden. Pretty rooms with splashes of bright colour and private balconies. Enjoy the traditional regional cuisine and wide range of Portuguese wines. Value chic - Reasonably priced charming Baroque and Renaissance Pousadas steeped in history with, plush rooms and pretty courtyard garden. Sights nearby - Within walking distance of the town’s great sites, such as the 16th-century Igreja da Misericórdia. Great walks - With wonderful walking around the hilly countryside and through the historic town. Bright white beacon of slick sophistication amidst rural farmland. 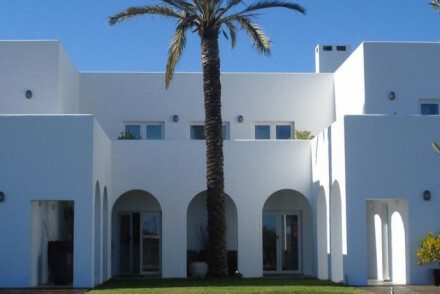 A Moorish style guesthouse with modern white on white bedrooms, tranquil gardens, a stunning swimming pool, and nearby beach. Ideal for completely unwinding. Beach Life - Set next to some of Algarve’s unspoilt beaches, enjoy long walks, boats trips, swimming and fishing. Birdwatching - The B&B sits in the Ria Formosa Natural Park, wander around its famed island lagoons and try and spot the local birdlife. Local markets - A must for all foodies is the Olhão farmer's market every Saturday. A unique boutique hotel on the beach front. 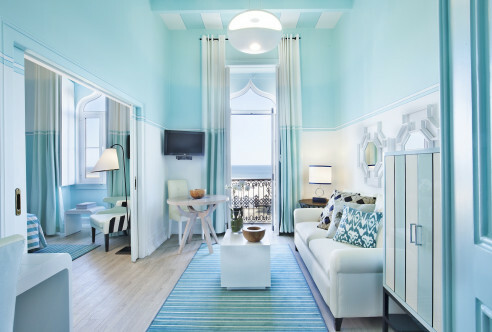 Cerulean blue walls in striking rooms and suites match the azure of the sea seen from private balconies. Excellent spa facilities and a dreamy swimming pool make this spot a very luxurious beach holiday. Beach Life - A unique setting, almost completely surrounded by a beautiful sandy beach. Watersports - The property sits directly on the beach. 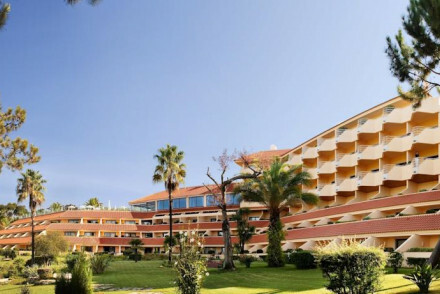 A prestigious 5* star property in the Algarve with fantastic facilities, panoramic views and private bridge to the beach. Suites are spacious and well decorated with balconies and a great selection of restaurants. Enjoy the luxurious beach life with a range of activities, pools and spa treatments. Active Holiday - A golfers paradise with four courses within the Quinta do Lago development, plus ping pong, hiking, cycling, and watersports. Total relaxation - With five star facilities, top of the range spa treatments, Hammam and plenty of poolside lounging. Great walks - Wonderful walks along the Quinta do Lago and along the private beach area.